Stop accidental spills from occurring with this Carlisle fast food tray. The classic scratch-resistant basket weave design reduces slipping on this lightweight tray, constructed of polypropylene. This 12 in. x 16 in. 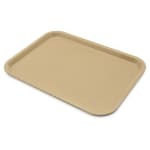 fast food/cafeteria tray comes in placid beige color and is sold in a set of 12. This versatile tray is suitable for use at buffets, school cafeterias, healthcare facilities, fast food restaurants, and more.